Too good to be true I thought it was a scam, until Tuah send me the ticket itinerary and Iz confirmed the ticket with AirAsia. Alhamdulillah. Ruang dan peluang, rezeki dan nikmat. 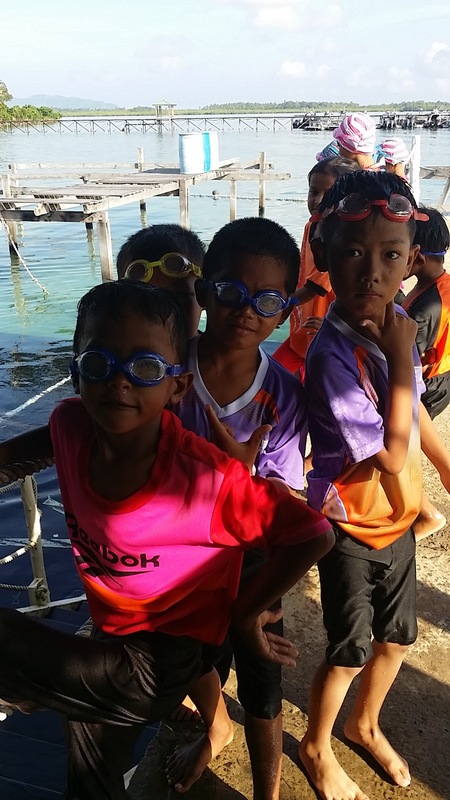 IRenang got invited all the way to Semporna to conduct an aquatic therapy and swimming program for students in Pulau Bum-Bum, Semporna, Sabah. All four of us went to Semporna, all expenses paid for two. You may read more details on the program at IRenang's blog. Is a tagline given by Tuah, a very dedicated teacher in SK Terusan Tengah who is in charge of this whole program. He rebranded his remedial class to Akademi IQ and conducted weekly weekend out of school program for his 11 students. Ours was the last session for the year 2016. His dedication, how he went out of his way for all his students might put some teachers to shame. I've never met a teacher so dedicated and committed as he is. It was an unexpected trip. A new experience. Everything, every single day, every moment is so new. Not the kind of trip I expected. Starting from KLIA2. First time travelling pregnant, first time bringing along 12 noodles on the flight, and first time on the plane with a husband. First time going to Sabah. 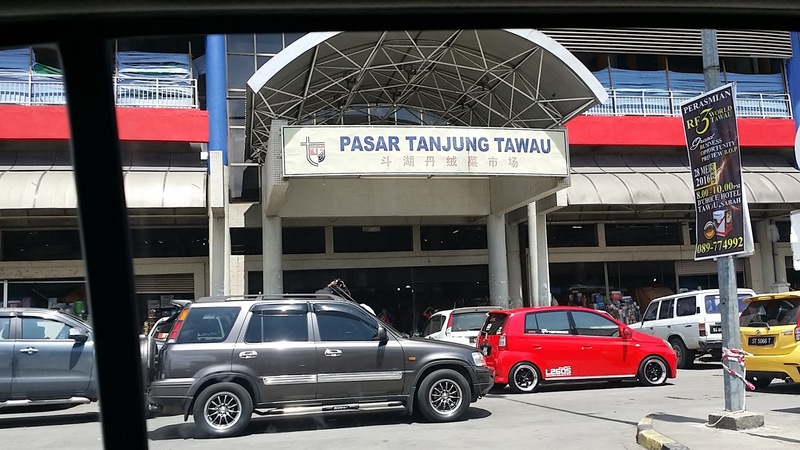 A not so nice landing, especially for a first time flying pregnant woman, we landed in Tawau Airport with a thud. Imagine you're driving fast and suddenly bumped into a hole. Mum shrieked (she was the only one who did), I was surprised, of course, but the local next to me seemed calm. He said this is normal. Oh, okay bah... It was only 7pm but man, it was so dark already! Tuah was already waiting for us at the arrival hall. Upon seeing him, again, deep inside I felt a huge relief. Not a scam, not a scam. This is real, this is actually happening. Tq Allah for this opportunity. 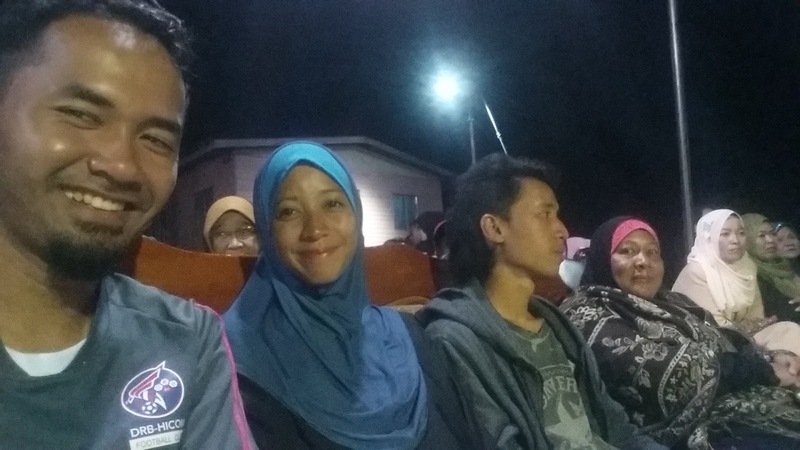 A very dark and bumpy ride from Tawau Airport to Semporna Town, with the smell of Sup Payau accompanying the 1 hour plus journey while listening to inside stories of Semporna from the perspective of a Semenanjung teacher speaking in Kelantan dialect with Iz. Dah jumpa geng, gitu lah. We stayed in City Inn Semporna, right in the middle of Semporna Town. 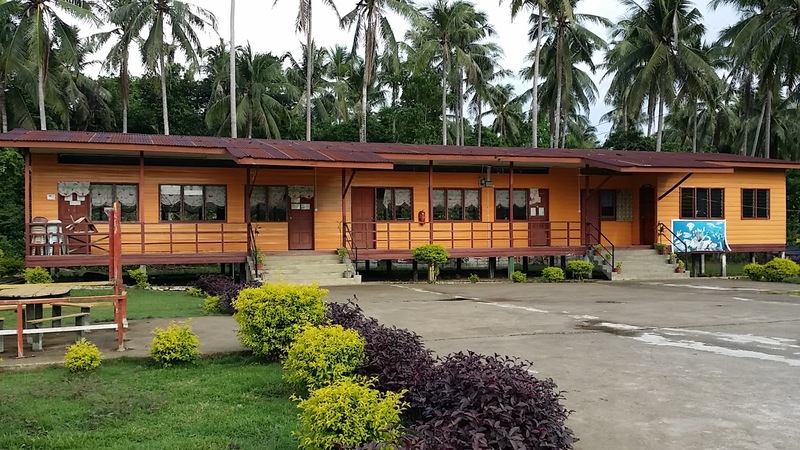 It is the cheapest budget hotel in Semporna and the only one that provides a room with 4 single beds, which is the only thing we requested from Tuah in terms accommodation. All four in one room, easy to discuss and plan. Biggest advantage of a family business. There's a petrol station, Shell, in the middle of shop lots. Rows of shop lots and there you got Shell. How actually did a petrol station ended up in the middle of a shop lot is a wonder. Haha. We had our first breakfast in Semporna at a kopitiam in Semporna Town. Tuah said it is one of the oldest kopitiam in Semporna. 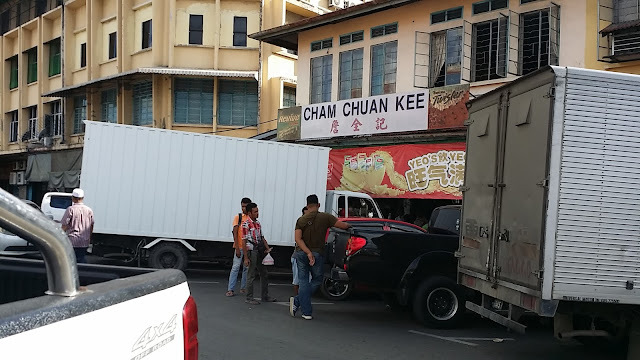 Cham Chuan Kee. Although the name is in Chinese but it is halal, as the owner is already a Muslim. There are a lot of kopitiam like this; chinese name but halal. Inside the kopitiam were also a lot of Muslim customers. Here, I learnt a new word. Teh nai beng for teh ais. Nai is for susu. Oh, by the way this is around 8am, already so hot and sunny. 8am teh ais in Semporna? No problem! Around Semporna Town, we could find many old ladies selling cigarettes along the walkway. No, seriously. Old ladies selling boxes of cigarettes. I was curious and took a peek in the box. I seriously thought they were just sitting there, or to repair shoes, but then I saw boxes of cigarettes in the box. Boleh juga beli sebatang-sebatang. Chairin even said he overheard a young boy about 5 or 6 years old asking his mother whether there are cigarettes sold at the shop. As in asking like wanting, he wants cigarettes. After a short visit to SK Terusan Tengah, Tuah took us on a tour around the island in a roadtax-less van, which the locals refer to as bus. Bum-Bum Island is so big! There are a lot of villages and a lot more dogs than goats. Sometimes from far I got confused is that a dog or a goat, because they have the same spots! Cats are hard to be seen. Along the journey around Bum-Bum Island, I get to see their lifestyle. Everyone out and about, playing with all sorts of things. Kampung style. Small stalls selling petrol could be seen along the way. We dropped by a few places to view the scenery. Lucky too we managed to see a Palaoh catching fish. 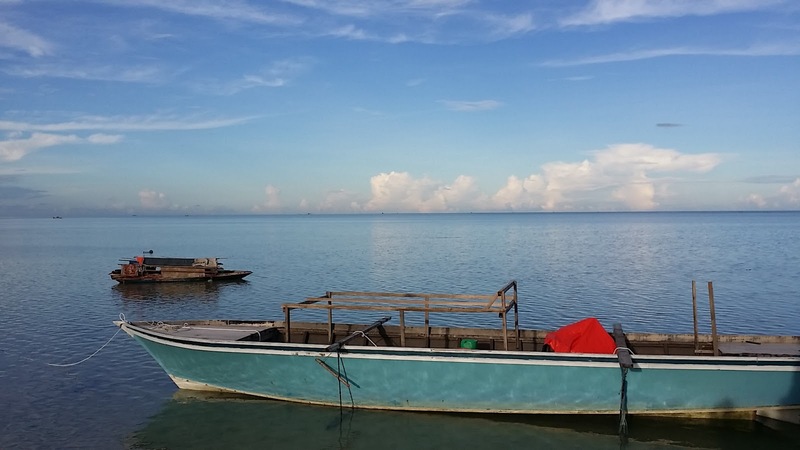 Palaoh are Bajau Laut that lives in a boat at the sea. The fish that they caught will be cooked in the boat. I could see their cooking and eating utensils too on the boat. 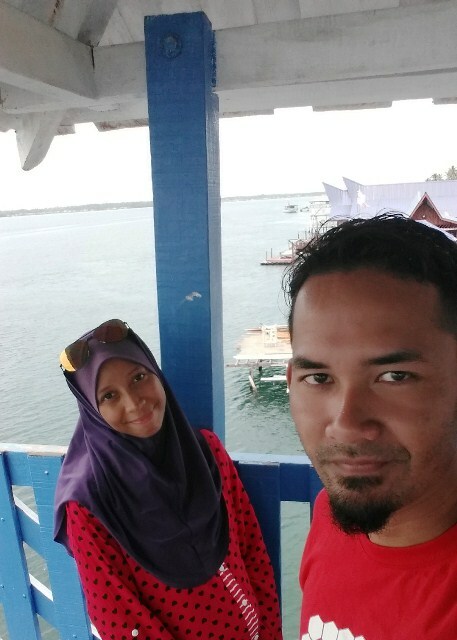 Tuah joked, "Kalau nampak bawak boat jauh ke tengah tu, faham-faham jelah tengah buat apa.. Haha" Well, basically, yes, they lived in a boat. But sometimes they will go on land too. A roundabout. Definitely no traffic light here. 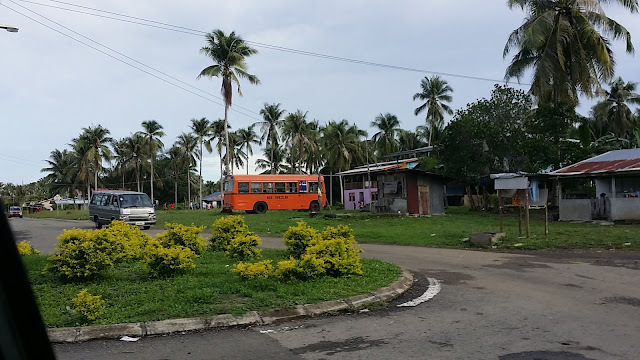 The orange bus is the oldest bus in Bum-Bum Island, repainted. A very scenic view at one of the villages. Can't remember already what village... The small boat behind there, is a Palaoh's boat. Staying in a hotel right in the middle of Semporna Town, it was easy for us to walk around and see life in Semporna itself. Iz and I even managed to steal some time together for a quick evening meal at a mamak near our hotel. Iz had Mi Hailam while I ordered Mi Bandung. Tuah already told us the food here tasted different than those in Semenanjung. True enough. Tokseh gi. Cannot go. The Mi Bandung is so tasteless just at one spoon Iz commented, "Tak cukup bahan". Such a polite guy. The Mi Hailam was also tasteless. Chairin and mum asked us to tapau food for them. To minimize wastage and also not wanting to take anymore risk, we ordered only one mi goreng mamak for both of them. That was the only restaurant we went by ourselves, the other restaurants during our stay were set already by Tuah. But that was the only meal that was tasteless. During the whole journey, we enjoyed every single meal! Mum found out about Sup Payau and Tuah actually bought one for each of us. So banyak... Plus, adding to that were delicious dishes at a restaurant he made bookings already which was super sedap. 5 days, semua ada. 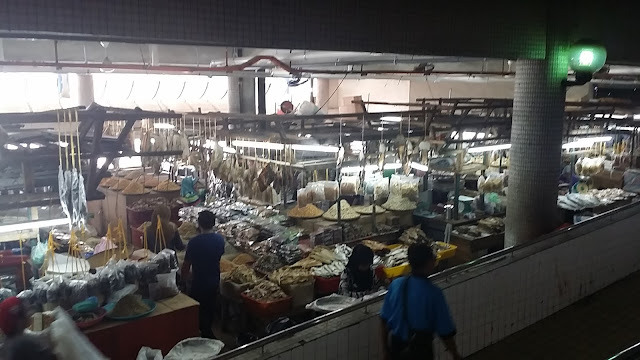 Udang, sotong, ketam. I didn't expect to have all three udang, sotong, ketam in Semporna. Really. But, rezeki oh rezeki... And those are all sponsored! The second night, at our usual place (a pink restaurant at the very far end next to Century Department Store), they served ketam! Oh my oh my... My mum, Chairin, and Tuah weren't really fans of ketam. So basically Iz and I got no choice. We got no choice other than to finish 'em all up! And the restaurant owner saw me eating slowly, patiently... Kesian ibu mengandung ni suka sangat makan ketam. Bersabar betul kopek satu-satu. And he added more! Like really finished all his stocks even. That night, seriously, I could feel my baby moving like a crab. Bayangkan tangan-tangan ketam in my stomach. That was how I felt. The three of us; Iz, me, and my baby, couldn't sleep that night. Kekenyangan teramat. Teruk. Memang teruk. Still about food, hehe. We got invited to a wedding ceremony! Our boatman for the past two days invited Tuah, and the four of us too. When told by Tuah, I immediately agreed. 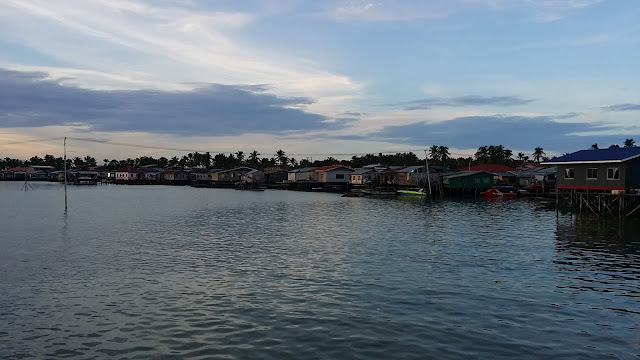 Although it is in Balimbang, which meant taking a boat in the middle of the night. They always have to ask me first, the preggy one, takut tak larat. In Semporna, wedding invitations are limited and exclusive (according to Tuah). It is normal not getting invited to a wedding eventhough it is just next door. Just because you're my neighbour, you think you're invited. Na-ah... No, no, no. If they don't want to invite you, then they don't. They can play loud music the whole night (usually karaoke can last until 12pm or later) and still not invite you. But they are okay because when it comes to their time, they will do the same too. Both the bride and groom is only 17 years old. So young! Balimbang is one of the village in Bum-Bum Island. The boatman picked us up at Seafest Jetty around 9pm and instead of getting off at Balimbang Jetty, we went straight to one of the water houses. Walked in between houses, there was one house selling snacks and junkfood, past a graveyard, and there, in the middle of a court, were seatings and the bride and groom on the wedding dais. As soon as we arrived, wahhhh such a VIP treatment! Hahahah.... Those seating on the sofa (front row) were asked to give their seat to us. Like, tepi-tepi VIP datang nak duduk! More like VVIP. Fuh... Not sure because of Tuah (cikgu, kan) or because of the four of us (orang Semenanjung/ orang luar). 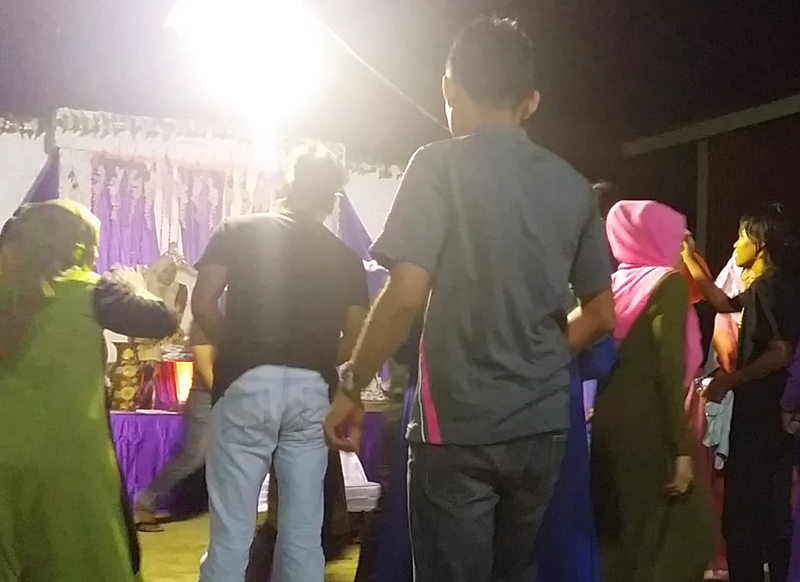 Haha... Witnessing a Bajau wedding first hand, first class seating, hehe, was definitely something I really, really am thankful for. 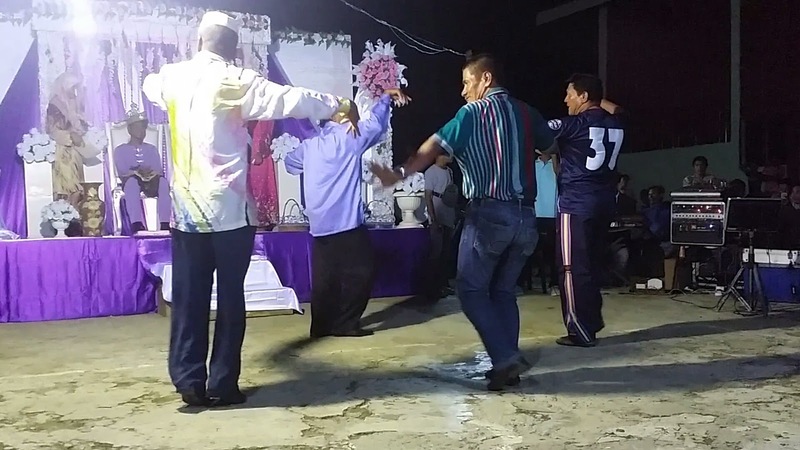 It is not often you get to see a Bajau traditional wedding, with their Igal-Igal dance. Mengalai igal-igal. Igal-igal dance by the bride and groom was the most epic one, seriously! While dancing, people will go and give money to them. They'll put it between the bride and groom's finger. If the money fell down, no worries, the family members will pick it up for them. Iz politely put a note in between the groom's headpiece. Hahah... One guy simply threw a bundle of RM1 notes at the couple, leaving us open mouthed. Whoa... Looks a bit insulting, but it's their culture. The couple danced two rounds. By the second round, the bride stretched her hand already. Lenguh. We were served a plate each and a bottle of drinking water. For children, they were given in polystyrene packaging. 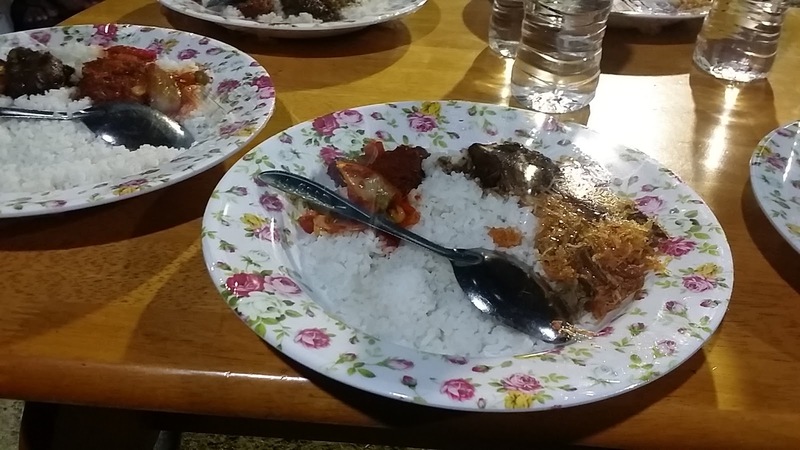 Nasi putih, ikan tongkol, sambal, and kelapa. So simple. If we were to serve only plain rice and fish during our wedding, instead of nasi minyak and daging, fuh... Mesti orang mengata. Oh, by the way, if you're not so keen on plain water, there is a stall selling soft drinks nearby. Seriously! Opening a stall selling soft drinks at a wedding ceremony? Brilliant idea! Oh by the way, they love cola. Coca-cola, soft drinks. One of my students even brought a bottle of soft drink during our program. "Bawa air tak?" "Bawa", and she took out a bottle of soft drink. The elderly will start the Igal-Igal first. The bride and groom swarmed by guests giving money! Iz (grey & pink) going to give money, too. Did I mention after the wedding we went to eat some more? Yes. Because Tuah already made bookings. Ada apa? 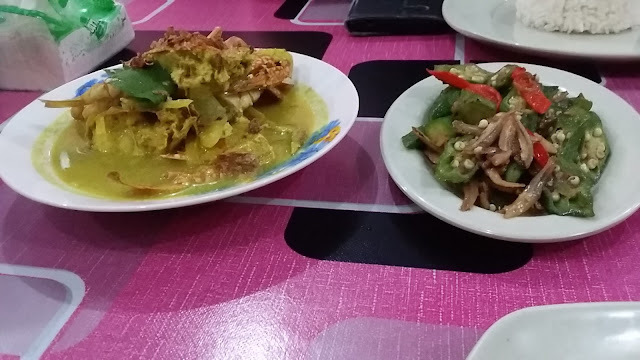 Udang laut masak mayonis, sotong goreng tepung, sup ketam. They have laksa sarawak, too, but cannot go already. Bersabar sebab dah makan kenduri jadi storage terhad. He went to the uncle and said, "Pakcik, kau salah bilik ni bah" and went back to his bed. I can't believe he was as calm as that. In such an emergency, you can still go 'bah' 'bah'... Maybe we forgot to lock the door, penat sangat. I on the other hand, had trouble sleeping until morning. Jantung laju. Old man at night, children beggars the next morning. Such a last day in Semporna! As soon as we stepped out of the hotel, 4 children beggars approached us. Aggressive ones! They wouldn't let us get in the car, they held the door, purposely stood behind the car when we want to reverse... Uih. 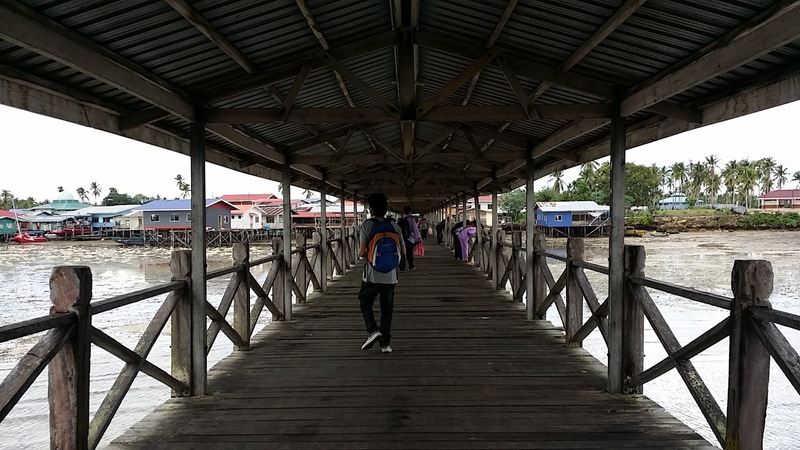 Some of them begged for money, some of them do business at the market or around the jetty. Those who do business sell plastics. 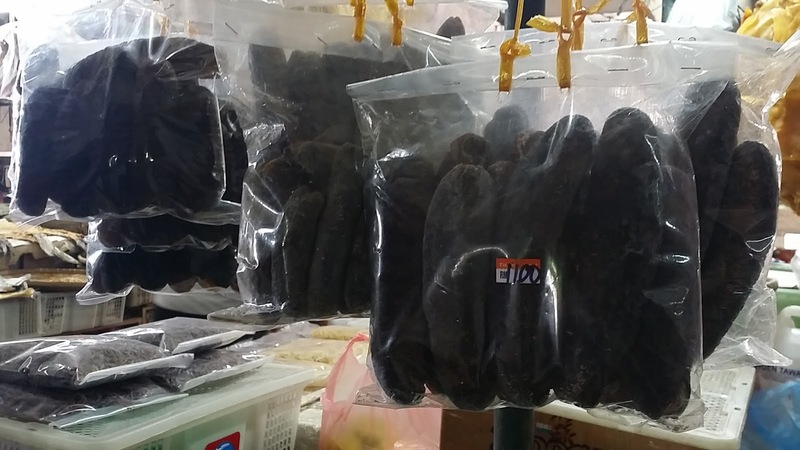 Tuah took us around the old Semporna market and we saw some of them carrying small black plastic bags. Plastics for what? Why would people buy plastics? You see, when people buy stuffs; ikan-ikan, they will need plastics to carry them right? So itulah. 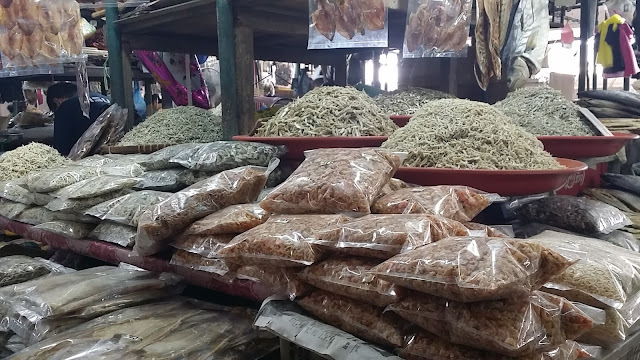 They sell plastics for you to keep your ikan-ikan inside. For a business woman like me, this opened up my mind, really. Business is about taking opportunity. Even the smallest, the slightest idea can create business opportunity. Plastic bags. Who would've thought about that! Before leaving Sabah, on our way to Tawau Airport, we dropped by at Pasar Tanjung Tawau, the largest indoor market in Malaysia. 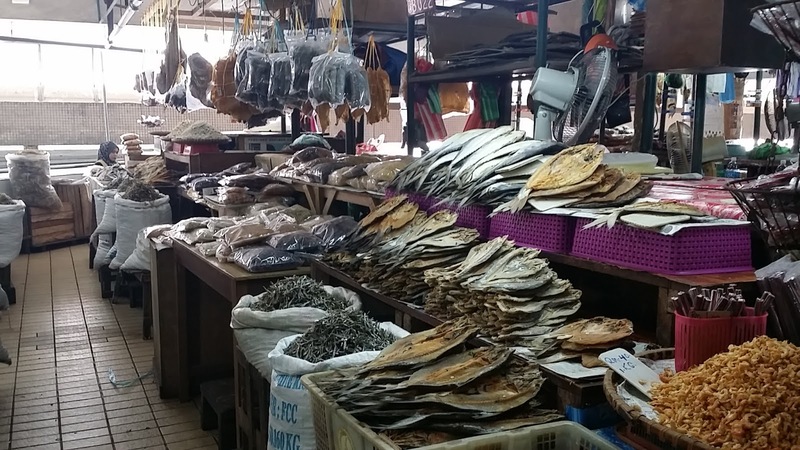 There are a lot of things to get here (especially for your in-laws), basically udang kering, sotong kering, ikan bilis, even timun laut kering. So, best tak Semporna? Hahaha... Maybe I should come again to explore the other side of it. The Sipadan, Mabul side of it. As for now, when thinking of Semporna, I could only think of my Bum-Bum Island students; Nasarudin, Jep, Ali Akbar, Rayhan, Azka, Nazim, Joe, Misa Ana, Norsida, Norsila, and Syafikah. "Dalam perut kau ni macam ada anak la, cikgu"
"Iya lah, memang ada anak dalam perut aku ni"
"Cikgu, semoga kau mudah beranak... Biar anak kau keluar terus, tak perlu bidan tarik-tarik"
Yup, 28 weeks pregnant. Still teaching swimming all the way to Sabah. Alhamdulillah. Baby A, you gotta be strong like mama okay. And thank you for behaving well (though I know you like it in the water.... gelitik-gelitik bila dalam air!) 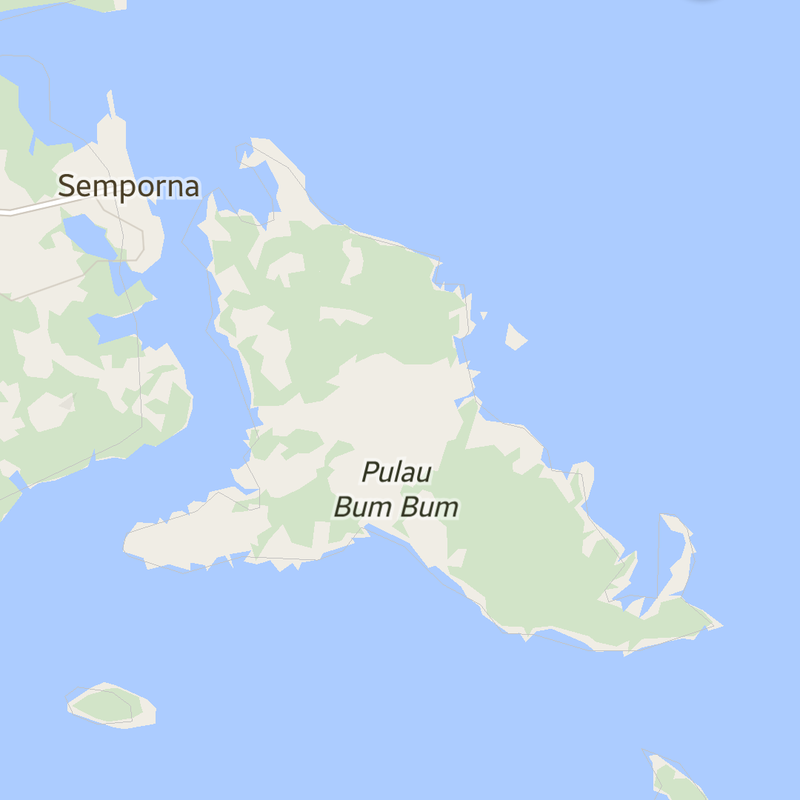 There was one time I was sitting on the deck in Bintara, Kampung Tampi-Tampi, I felt Baby A move as if it's swimming. Hahaha... Oh, we have to come again. Nak terjun tiruk dari menara! "Cikgu, semoga kau mudah beranak"